As marijuana becomes legal in California for recreational use in 2018, law enforcement agencies across the nation’s most populous state are preparing to address its inevitable effects on vehicle operation. This San Diego-area stop sign has caused confusion and delay for decades; city planners only expect it to worsen as people begin to endlessly reflect on their own tallness while driving. SALSA was formed as part of the agreement with pro-marijuana lobby groups in reaching an agreement with state legislators in mid-2017. Trent Dufresne, Spokesman for NORML (the nation’s largest marijuana lobbyist), has worked diligently to address law enforcement concerns by negotiating for appropriate changes in traffic laws to accommodate up to 10 million drivers per day who may be under the influence of marijuana. 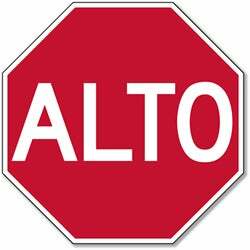 Stop signs that rotate to say “Go” if a car remains stopped for more than 10 seconds. Drive-thru restaurant windows that can serve both sides of the vehicle at once. Expansion of HOV lanes to allow for broader definition of existing acronym. Audible velocity indicators to aid in driver speed control. Law enforcement and state government agencies believe that recreational marijuana’s high taxes should provide sufficient funding to make some incremental improvements, but believe that SALSA’s expectations might have gotten just a little too high for the situation. California governors have a long history of pro-marijuana positions.